Every baseball fan knows the Legend of Jackie Robinson: how he was the first man to integrate baseball; how he was vilified and slandered, and yet maintained his discipline and strength and classiness to the end; and how his story represents the best and worst aspects of a country that has struggled from its inception to live up to its founding credo. The question for us today is whether cricket has an equivalent, and if so, who it might be? The question is tricky because cricket has a number of individuals who in their own way literally changed the complexion of the game. The Indian prince Kumar Ranjitsinjhi (1972–33) was the first person of color to play for England, although that was mainly because there wasn’t an Indian national side at the time. Moreover, being a royal buffered him from the racial slurs that came his and others’ way. George Headley (1909–83) lifted West Indian cricket to a prominence it hadn’t had before. The recently retired Makhaya Ntini was the first black player to play for the post-Apartheid South Africa side. However, cricket has for decades featured games with people from a variety of countries playing for the same side. What we’re looking for is someone who possessed Robinson’s combination of grace under pressure and ability to handle the expectations placed upon him by a people hungry for respect, recognition, and dignity. 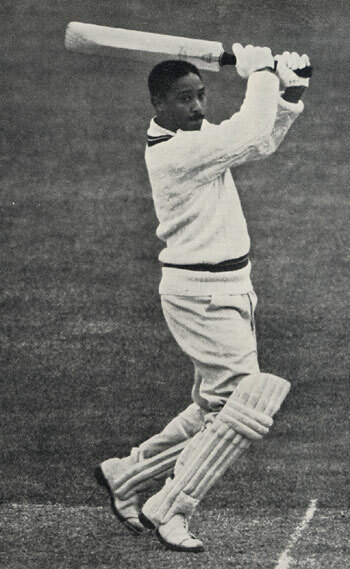 As far as I (Martin) am concerned, one man fits the bill: Frank Worrell (1924–67). Even though black people had been playing cricket for the West Indies since the 1920s, anomalies remained. The hidebound (and, frankly, racist) cricket authorities determined that the team—made up of players from the Anglophone colonies of the Caribbean—could only be captained by a white man. (You can probably imagine the excuses they gave.) This situation obtained until the late 1950s, even as the considerable depth of talent in West Indian cricket became obvious. Finally, the historian and cricket journalist, C. L. R. James wrote a much-heralded article calling for the West Indies side to be led by a black man. That man was Frank Worrell. Along with his fellow Barbadians Everton Weekes and Clyde Walcott, Worrell was a world-class batsman. But, crucially, he saw the cricket team as more than just a chance to play internationally. As Britain’s empire began to dissolve in the 1950s, Worrell saw an opportunity to knit Jamaica, Barbados, Trinidad and Tobago, Guyana, Antigua, and other islands into a cohesive unit on the field and thus mirror a potential political federation, where the whole was more powerful and effective than the parts. As it turned out, Worrell (who, like Jackie Robinson, died prematurely) never got to see his political dream realized. Rather than join together as a federation, the islands formed their own nation states, diluting their political and economic power. On the cricket field, however, Worrell’s vision triumphant. He led the West Indies on a hugely successful tour to Australia in 1960–1, and through force of character and discipline, initiated an almost three-decade period where the West Indies cricket team not only competed at the highest levels but, in the 1970s and 1980s, became easily the best team in the world. While other men can be accredited with the greatness that followed Worrell (just like others stood on Robinson’s shoulders), it needed someone with conviction, forethought, and incredible discipline to make that happen. This entry was posted in Baseball, Cricket, West Indies and tagged Clyde Walcott, Everton Weekes, Frank Worrell, George Headley, Jackie Robinson, Kumar Ranjitsinjhi, Makhaya Ntini, Politics. Bookmark the permalink.